The VintAxe Guitar Forum • View topic - Need Help identifing maker and age of Palm-Tree Guitar. Need Help identifing maker and age of Palm-Tree Guitar. I was given an old parlor guitar that belonged to a Great-Great-Uncle of mine. My guess is that it dates back to the 20's or 30's but It doesn't have a label or maker's mark. It has the Palm-tree motif on it's top. It suffered from severe damages but I had it repaired so it is now playable. No doubt it isn't worth much but as a family item, I'd like to know more about it. It may be a Harmony or Silver-Tone, (same thing, really) brand but I can't be sure as there appears to be no label and looks like there never was one. My great, Great uncle lived in Southern, Minnesota and he may have ordered it through the Sears Roebuck catalogue but that is just a guess as he is long dead now. That's all I have to go on, other than these photos. Re: Need Help identifing maker and age of Palm-Tree Guitar. I think you are right about your guitar. It is a Parlor guitar and probably originally had a Supertone label in the sound hole. 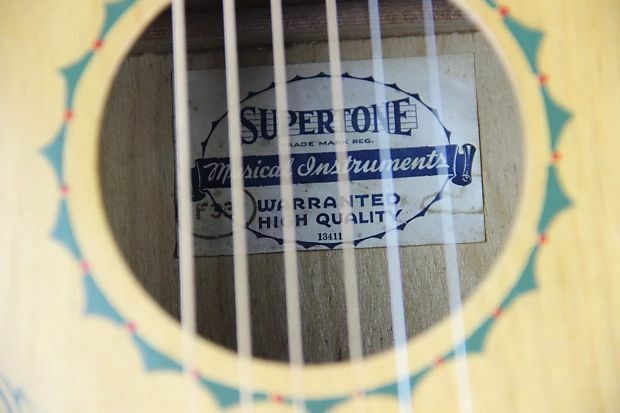 Supertone was a brand made by Harmony and sold through Sears. These instruments are known as stencil guitars. The most popular themes for the stencils were Hawaiian, Cowboy and Romantic European destinations (think gondolas). Here is a Reverb link to a guitar like yours selling for around $250. Of course, given the damage on your guitar you wouldn't be able to sell it at this price, but like you said, it's a NFS family piece so you don't need to be too concerned about market value. Thank you for your reply to my inquiry. 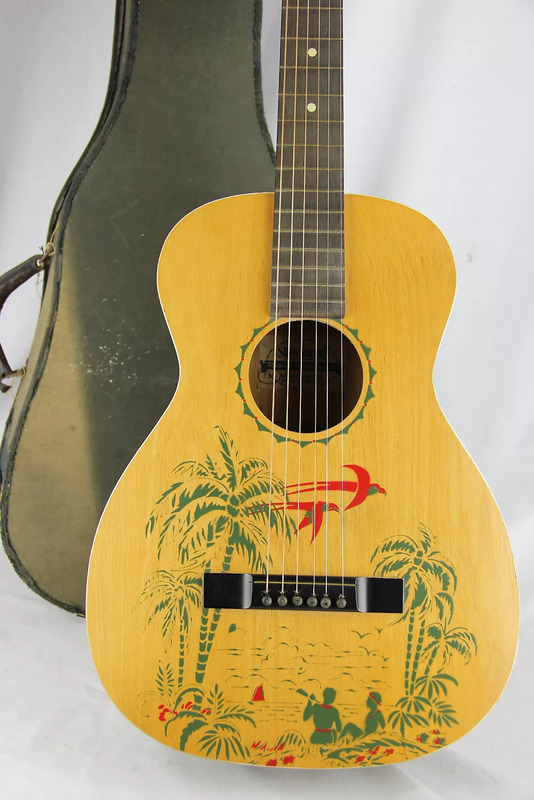 I had searched the internet for images of these Hawaiian, stenciled guitars in an effort to date it's construction and had come across a picture of a similar model that reported to be of 1933 vintage as well. As this theme re emerges by different makers and in different decades I was not very sure if my information was likely accurate, however. I checked the exact stencil against my own, as well as the type of bridge and head stock and tuning pegs. Everything matched while other models and years varied on several of these details. Now you respond will the same date as I thought most likely. It is, by no means, absolute proof, but it does leave me reasonably confident to say that mine is, indeed, a 1933 Supertone Hawaiian guitar. Considering All of the damage that this guitar suffered it is not surprising if the label fell off the wall of the guitar. Almost ALL of the braces were missing from within so it clearly had been stored some place very dry. In a way, it is a testimony to the conditions folks lived in at the time. There were no air conditioners or humidifiers. My great Uncle Henry lived in Southern Minnesota which is both extremely hot and cold, depending on the time of year, and insolation and heating of homes was somewhat rudimentary. I am amazed that It was in as good a shape as it was, when I got it. Nobody had ever tried to repair it and yet it's neck was fairly strait. Now it is in very good playable condition aside from the cosmetic issue of the visible glued repairs. I am very proud of my family and this guitar that reaches back to the depression era as a reminder of the folks that came before me and the many things that we have in common.